Agilent Technologies has announced higher safety ratings for its U1240A Series and U1250A Series handheld digital multimeters (DMMs). New test probes and improved fuse protection enable CAT III 1000V and CAT IV 600V ratings, improving user safety in electrical testing and measurement. The new test probes use 4-mm tips, a length that minimises the chances of high-energy sparking, especially in CAT IV environments. As defined by the International Electrotechnical Commission (IEC), CAT III environments include three-phase distribution (and single-phase commercial lighting) while CAT IV environments include three-phase utility connections and outdoor conductors. Agilent U1240A and U1250A handheld digital multimeters now use a 30 kA fuse to provide increased protection from high-voltage transients. During qualification of the 30 kA fuse, all digital multimeter models passed HIPOT testing at 2000 VAC and 2000 VDC between the microamp, milliamp, and ampere terminals and common ground. "The proper combination of DMM and probes is an essential element of safe operation in high-voltage electrical environments," said Ee Huei Sin, vice president and general manager of Agilent's Basic Instruments Division. "These new enhancements demonstrate our commitment to customer safety and expand our definition of 'essential features' in a handheld DMM." 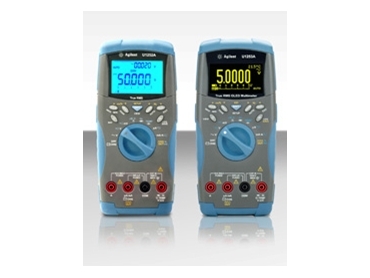 Agilent's U1250A Series of handheld digital multimeters includes the U1253A, a handheld DMM with an OLED display. The U1240A Series enables engineers and technicians to measure over broad ranges and perform a variety of checks faster with built-in capabilities such as harmonic ratio, data logging and a switch counter.